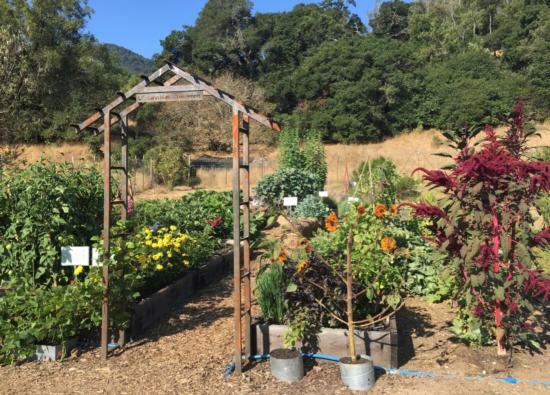 The Edible Demonstration Garden at Indian Valley Organic Farm and Garden (IVOF&G) was designed and installed by UC Marin Master Gardeners in the summer of 2016 to be used as a hands-on teaching tool for UC Master Gardeners and the public. The garden is the center of a seasonal education program that demonstrates science-based practices for growing food at home, in community gardens or in school gardens. 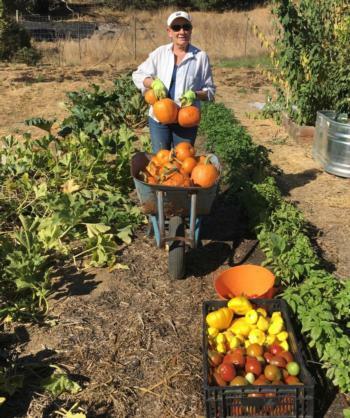 Workshops teach community members how to plan, plant, maintain and harvest vegetables while also offering classes on broader topics such as pest identification and management, trellis building and sheet mulching. 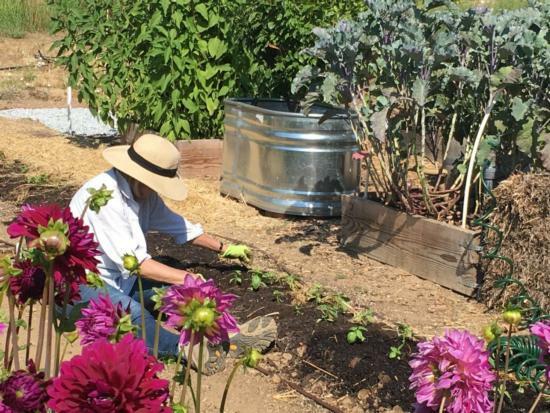 A team of dedicated UC Marin Master Gardeners maintain the garden and invite the public to help with seasonal garden care Tuesday mornings 9-11 am (May – September). Produce grown in the garden meets Marin Organic Certified Agriculture (MOCA) standards and is sold at the IVOF&G farm stand. Raised Box Garden: The raised box garden consists of six redwood boxes that are planted with a mix of annuals, perennials and herbs. Beds are changed seasonally. Straw Bale Garden: Growing food in straw bales is an example of container gardening with ergonomic benefits. Straw bales are in production March – October. Perennial Garden: The perennial edible garden showcases edibles you will plant only once, or only once in many years. It showcases the concept of edible landscaping, growing in containers, and growing in raised fir boxes. Fruit trees and herbs grow in containers while greens, asparagus and berries are planted in raised box beds. Exotic Spice Garden: UC Master Gardeners are experimenting with growing exotic spices including horseradish, paprika, ginger and turmeric. Side rows: The center of the garden is flanked by sets of rows on either side: to the left of the garden (or south) are rows of beneficial flowers, rhubarb and perennial herbs; and to the right (or north) of the garden, are rows of annual and perennial vegetables. Perennial vegetables include: tree collards, wild cabbage, and artichoke. Self-Guided Tours: You are invited to tour the garden on your own and self-tour guides are available on-site. Guided Tours: Private educational tours and trainings are available to groups for a nominal fee. To schedule a private tour, please contact Marin Master Gardeners at EdibleDemoGarden@MarinMG.org. Garden hours are the same as IVOF&G: Tues. – Sat. 9:00 a.m. – 3:00 p.m. Curious about the farm in which The Edible Demonstration Garden is located? It’s located in the Indian Valley Organic Farm & Garden on the Indian Valley Campus of College of Marin, in Novato. 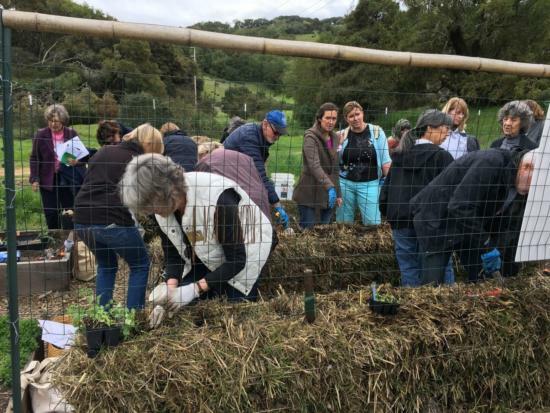 In 2006, three community partners, UC Cooperative Extension-Marin Master Gardeners, the Conservation Corps North Bay and the College of Marin embarked on a landmark project to establish this 5.8-acre educational organic farm. The Cultural Conservancy joined the partnership in 2013. In January 2018, the College of Marin became the lead managing partner and began a major renovation of the facility which is scheduled to be completed by Spring 2019. Farm facilities are open during the construction and the production area showcases sustainable agricultural practices while growing over 100 varieties of vegetables, fruits, flowers and herbs. IVOF&G invites the community to tour the farm, to shop at the Saturday produce stand and to buy garden starts at spring and fall plant sales.